I combine 15 years of golf writing experience with direct response copywriting techniques to help you generate leads and revenue. "Scott Martin is a talented and dependable writer. He enjoys golf and has a passion for direct marketing." Jim McLean, Founder and President, Jim McLean Golf School, Miami, Florida. If you're a golf marketing decision maker and you're serious about increasing your revenue, it's important you take 5 minutes to read this web page. Here's something I've discovered about golf marketing...the most successful marketers in golf subtly marry great golf writing with proven direct response techniques to maximize response and revenue. Provide their email address and other important information. In other words, my copy directly requests a response from the reader. Again...I'm not here to create award-winning advertising that looks good but does nothing to help the bottom line. I'm here to help you make more money. And I make myself fully accountable. I WANT you to measure the results of my copy and provide me with feedback so I can improve the copy and generate even greater response. That's right...I wrote a book about Caddyshack which is available on Amazon and other fine retailers. I've written or worked on 8 golf books as an author or editor and I've published hundreds of golf articles in national and regional magazines including Golfweek, Executive Golfer, and the Charlotte Business Journal. Over 100 golf websites. Click here for a recent course. The Insiders' Guide to Golf in the Carolinas (Book). Shouting at Amen Corner with Ron Green, Sr. (Book/compilation about The Masters). The Book of Caddyshack: Everything You Ever Wanted to Know About the Greatest Movie Ever Made. Small Business Success (book with Jim McLean). Rock Solid Golf with Dana Rader (Book). Well over 1,000 pages of articles for national, regional, and local magazines including Golfweek and Executive Golfer. I was formerly a member of the Golf Digest golf course rating panel. I speak the language of golf and I understand what golfers really want. The result: the copy I write will resonate with your target audience and they will buy more of what you sell. You know when there's an 'alien writer' in our midst...a writer who is NOT a golfer writing about the game. The copy is full of words and phrases no golfer would use. Golf copy written by a non-golfer confuses readers and will decrease sales. Only a very few golf writers fully understand how to write to SELL PRODUCTS AND SERVICES. As a direct response copywriter working for clients around the world, my job is to persuade the reader to take the next step in the sales process. When I write copy for you, I will write to persuade the reader to buy your product or service or, at the very least, provide a lead that's ready to buy. So...let me ask you a couple of quick questions. Question 1: Do you want people to feel good about your product? Question 2: Do you want them to feel good about your product AND make a purchase? If it's the latter, then contact me here right now. Contact me here for additional samples and a quote. Call me at 704-517-0241 or I'm on Skype: ScottMartin22. "Unlike most copywriters, Scott has a great understanding of direct response copy. The kind that actually makes you money instead of merely filling the page with prose! That's why we use him again and again." Andrew Wood. Legendary Marketing, Lecanto, Florida. 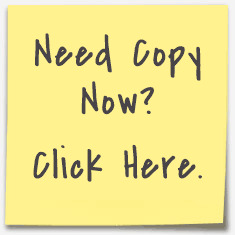 For specific information about my direct response copywriting, please go here. Here are some recent examples of revenue generating golf copy. If you need golf copy written by a golf copywriter, you can hire one of about 1,000 professional writers with golf experience. You can hire a golf copywriter who will write golf specific copy AND help you sell your product or service through the perfect combination of golf copywriting and direct response copywriting. I look forward to helping you generate leads and revenue. So the new copy seems to be performing very solid. The CTR is comparable to our normal article (18%) but conversions seem to be trending noticeably higher. It’s a new approach and it seems to be resonating well. You can also visit my golf-specific site for a golf copywriter.